In honor of the 2014 Winter Olympics currently being held in the Russian city of Sochi, we thought we would explore the rich history of tea in Russia, and the aspects of Russian tea culture that are still practiced today. 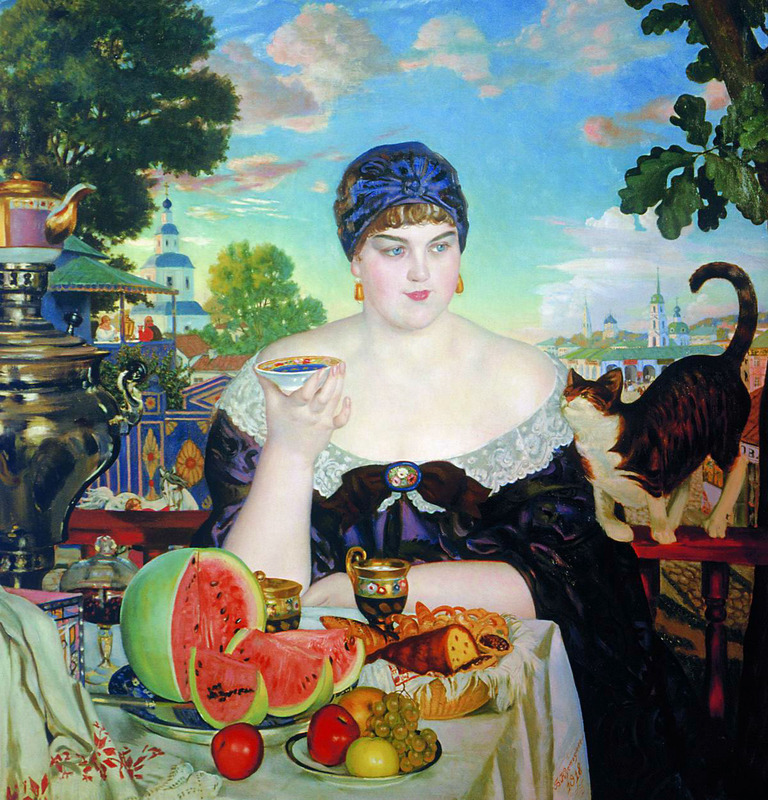 Tea was first introduced in Russia in 1638, when the Tsar Michael I was given tea as a gift from a Mongolian ruler. Starting in 1679, tea was imported from China by a caravan of camels on a regular basis, in exchange for Russian furs. The tea was expensive and therefore only accessible to the Russian elite until the Empress Catherine the Great established regular imports of tea via camel caravan in 1736. These camel caravans inspired our Russian Caravan tea, a hearty blend made from Chinese smoked tea (Lapsang Souchang) and another black tea. Russian Caravan is best enjoyed very strong and sweet. The price was gradually lowered to become accessible to the general population. The establishment of the Trans-Siberian Railway in the late 19th century made tea even more affordable, and increased the consumption of tea. Caravans took approximately eighteen months to arrive in Eastern Russia, but tea that traveled by train took just over one week. That’s 77 weeks faster! Samovars (самовар in Russian, literally meaning “self-boiler”) are heated metal containers that are used to boil water in Russia, as well as other countries in Eastern Europe and the Middle East. There is a heating element within the container, which keeps the water at a consistent temperature throughout the day. 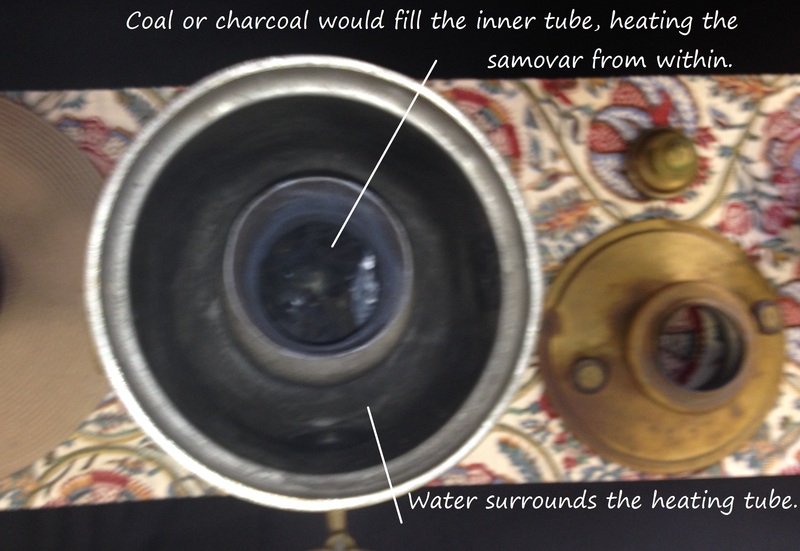 Modern samovars are heated by electricity, instead of the original coal or charcoal. View of a samovar from the top. 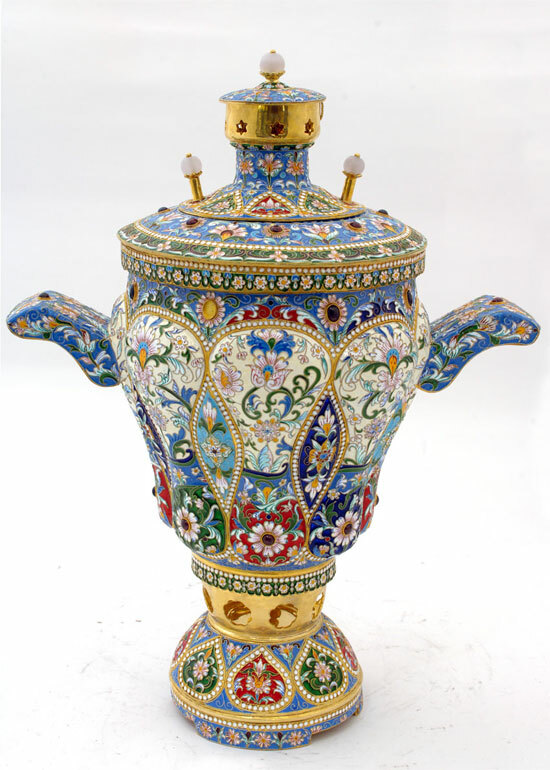 A late 19th century samovar. Tea in Russia is typically made by adding hot water that has been heated by a samovar to a strong tea concentrate (заварка, or zavarka in English). Tea leaves are originally brewed in a tea pot for breakfast, and the remainder is left to brew for the rest of the day. Many Russians use lemon, sugar, or jam to sweeten their tea. Instead of stirring the sugar into the tea until it is dissolved, some people will often hold a whole sugar cube in their teeth to sweeten the tea as they drink it. Many people drink tea out of glasses that are in a metal holder (подстака́нник, or podstakannik) in order to protect their hands from the heat. 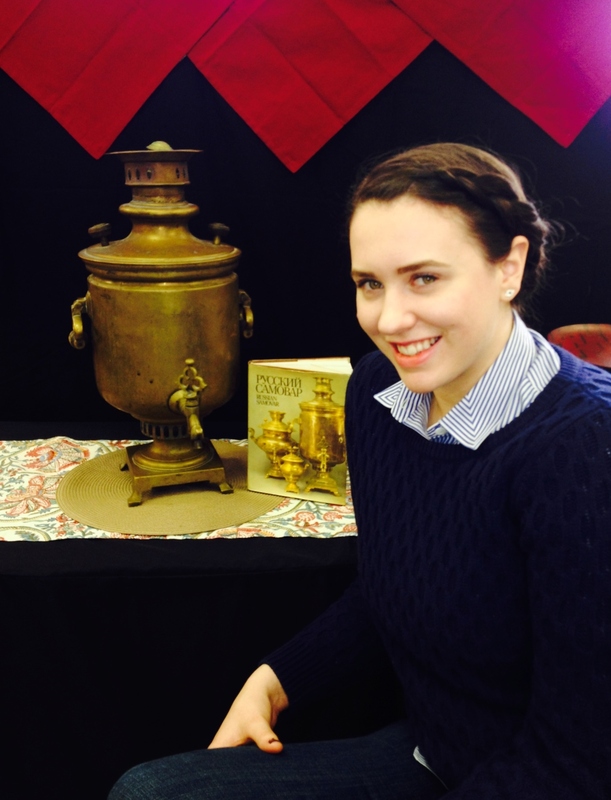 Me with my family’s samovar. It isn’t currently in working condition (it was made in 1870!) but we love to have it on display at our house as a reminder of our time in the Ukraine. My mother tells me that my first experience with tea was when I was a toddler living in the Ukraine. My parents worked with a seminary, so the whole family would often eat lunch in the dining room with the other staff and students. In the corner of the room, there was a large samovar, ornate and beautifully styled with black with gold and red accents, which kept water hot and made the process of making tea quick and easy for students desperate for a caffeine fix. Much to my mother’s horror, I was often offered a caffeine fix as well – although it was served in a saucer so it would cool quickly and not burn my tongue. The tea was strong but sweet, the company friendly and kind. I gradually explored and embraced the many different kinds of tea and tisanes as I grew older, from white to rooibos to herbal to green to black, and all the imaginable variations and blends. When I’m tired and cranky, I make myself a cup of tea and life seems so much more manageable. (My all-time favorite tea quote is by Bernard-Paul Heroux: “There is no problem so great or grave that cannot be much diminished by a nice cup of tea.” Indeed!) When I’m sick I turn to good old chamomile with a bit of honey. When I want a unique burst of flavor, Pangaea Joy is one of my new favorites. To me, tea can be both comforting and exciting, familiar and exotic. Tea transcends culture and brings diverse groups of people together. 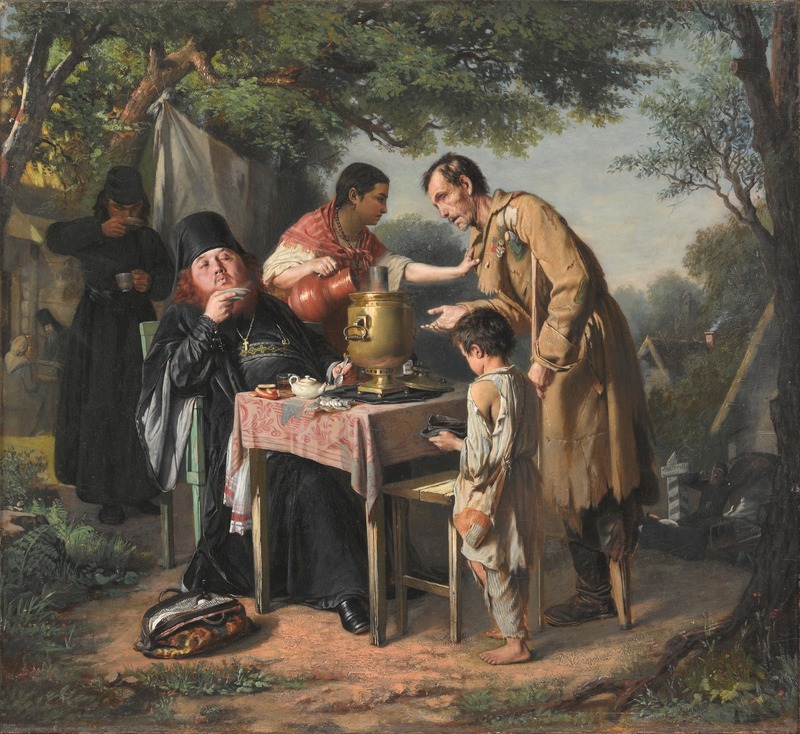 Tea has been a large part of my life since my childhood in the Ukraine, and I am so grateful for those first covert sips out of a saucer, with a little help from a samovar. 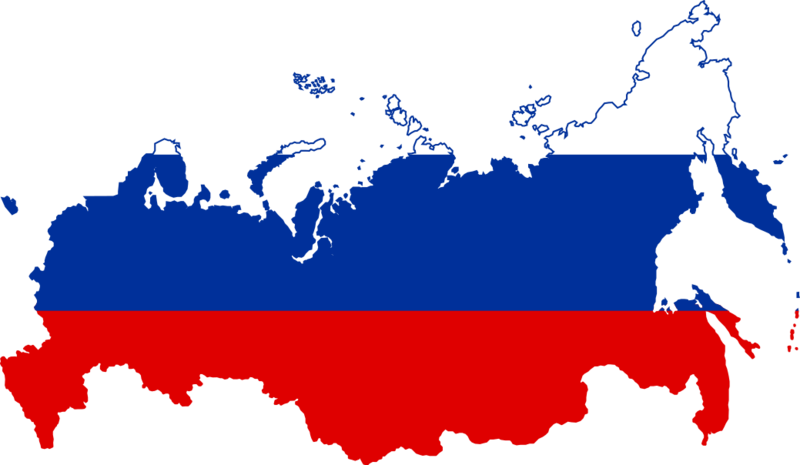 According to a 2005 study, approximately 82% of Russians consume tea on a daily basis. The oldest known samovar, thought to be approximately 3,600 years old, was discovered in Azerbaijan in 1989. It would most likely have been used to heat soups or stews, as tea would not yet have been known to this area of the world. Samovars come in all shapes and sizes. The body can be shaped like an urn, krater, barrel, cylinder or sphere, and the capacities range from 1 liter (1 US quart) to 400 liters (110 US gallons). Samovars can be made out of iron, copper, polished brass, bronze, silver, gold, tin, or nickel. They can be plain or elaborately decorated. The world’s northernmost tea plantations are in the vicinity of Sochi. What was your first experience with tea?